If Toby had so much mucous, then why was it a better day? Last week, when toby was still in the hospital, i came home to have dinner and spend the night with yoni. toby had been admitted for the second time in two weeks, he was neutropenic and his intestinal tract was lined with painful sores all the way from mouth to bottom. i rarely have any one-on-one time with yoni and we certainly don't have a chance to catch up on standard teen topics (he's almost 15). instead, yoni asks me how toby is doing and i report back something like this: "he's better, honey. he had more energy today and could actually watch tv. he had 8 spoons of broth. he didn't cry that much. and he only threw up once when we gave him medicine. what did he throw up? oh, the broth and about a quart of mucous." yoni was quiet for a moment and then made this brilliant statement: "If Toby had so much mucous, then why was it a better day?" It took my breath away. I laughed and laughed at the truth of his words. From the mouths of babes indeed. 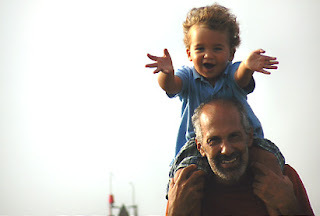 perhaps unwittingly, yoni had arrived at something very deep: an attempt to understand the enormous shift in perspective that cancer has wrought upon our lives. six weeks ago a scrape or tumble was cause for alarm. now i watch as toby endures daily pain that most of us cannot even begin to imagine. 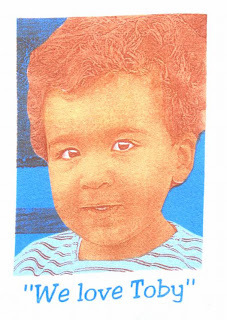 cancer has robbed my child of his softness, his innocence, his curls, his ease, his strength, his body, his endurance. It has also revealed some remarkable things. I have a little boy who says “please” and “thank you” and “excuse me” as poisons drip into his bloodstream. I have a little boy who has rediscovered the love of his older brother, playing catch together for 20 minutes after being released from the hospital. I have a little boy who sits on the stoop with his cousins and tells them that he is about to change their bandages and give them shots that will hurt. cancer makes the world outside the hospital seem unreal and soft at the edges. I stumble into the light after days and days on the 9th floor and I can’t understand what I see. Every person, every tree and house and street and interaction seems so vulnerable and beautiful that I want to cry. Did I live like this too, before april 17th? Did I notice that even Brooklyn looks like a thomas kinkade giclee reproduction? cancer makes words like “brave” and “courage” sound ridiculous. sometimes, during a particularly painful procedure, the nurses say to toby, "you're being so brave!" or a friend will tell us how courageous we are. honestly i don't know what those words mean. Maybe they are placeholders for feelings that are much, much bigger and unwieldy. They’re safe words, but they aren’t really true. Here are the words that speak to me: fear, numbness, why, desperation, intense love, sadness, more fear, exhaustion, hope. Our perspective has shifted and I find hope in strange places. Toby threw up a quart of mucous, but he giggled when we tickled him under his arms. The pale, skinny, hairless children at the hospital don’t look half-dead to me anymore. I can identify them, I can match them to their parents, seeing them day after day is enormously reassuring to me. The children look half-alive now. I sometimes find it hard to look at healthy children. They are so beautiful. I cannot believe how much they climb and laugh and run and whirl around. and this: The children at beansprouts are studying insects: the ladybug sheds her skin over and over again, each time revealing new skin underneath. One day she feels very tired. She stops eating and curls up. And then she waits. When her new skin grows hard, it splits and she climbs out of it one last time. She is very, very pale. She waits. Slowly, slowly, slowly her color grows stronger. Her black dots appear. She is a ladybug. We love you all. Pray for Toby. I've just returned (along with my wife Gila, & our 2 girls, Isabel & Ayelet) from NYC where we spent the weekend with Toby, Yoni, Mooki, & Stephen. I haven't seen Toby in several weeks & this was the first time Toby's cousins have had an opportunity to visit since he was diagnosed (Isabel & Ayelet traveled to NYC a few weeks ago, but Toby was admitted to Sloan the day of their arrival so they couldn't visit). Toby greeted us Friday afternoon bald & quite a bit skinnier, but still as sharp & inquisitive as ever. After a short "warm-up" phase, Toby, Isabel, & Ayelet were like the three amigos. Toby, sat on the couch & played DJ, adeptly manipulating his trusty boom box between various favorites, all the while grooving to the tunes. Stephen's "shake it, don't break it" was all the motivation he needed. Isabel, never one to shy away from an opportunity to dance, somehow managed to adapt her ballet moves to keep in step with Toby's eccletic tunes. Not to be left out, Ayelet (inbetween stealing bites from Toby's perfectly color coordinated, diverse, & healthy plate painstakingly prepared by Mooki) rolled between her cousins on Toby's Good Humor truck. The cousins then made for the closets where Toby introduced the girls to one of his favorite games "elevator." They traveled between the various floors of Macy's with Toby acting as elevator operator, food deliveryman, & chef. By the early evening Toby was running(!) from room to room & while not nearly as chatty as Isabel, he held up his own. By dinner reality had snuck back in; Toby began to limp & while we cleared our plates & then some, Toby nibbled only at his food. While we were enjoying each others company, Sonya & Itamar were packing up part of the 13th St. Apt (& they returned today for more). 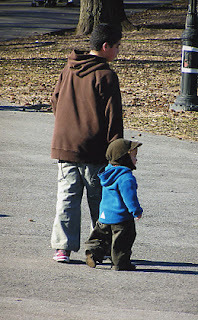 Saturday we headed to the Clinton St. park where the cousins played "train." They pushed their carriages around the circle at least a dozen times. We then tested each other's accumen imitating animal-calls based on Ayelet's choice of various creatures. Yoni & I played whiffle ball (he's very good) & then we all walked to Nino's Pizzeria for lunch. While Toby took a well needed 3 hour nap, Yoni & I went to Prospect Park where we played more whiffle ball & frisbee (he's pretty good at that too). After a late dinner, Toby, Mooki, & Stephen went out for Italian Ices. Sunday morning, Mooki took Yoni to Prospect Park where she filmed him launching rockets. Toby & the girls played some more & I got a chance to read Toby & Ayelet one of my favorite books (Bee Bop Express) about a train hauling jazz musicians from NYC to New Orleans. As expected Toby left his mark on us all. 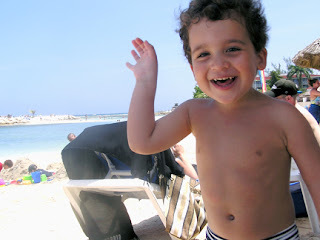 Ayelet (2 years-old) has a new mantra, "Toby & Yoni my cousins, I love them." I feel very fortunate that we were able to enjoy a semi-normal weekend with Toby, which will probably be the last one for a while. Tuesday, Toby has reevaluation scans to assess how much his tumor has responded to the chemo. Later Tuesday he starts his 3rd cycle of chemo (this time with 2 different medications he has yet to receive). The idea being to keep the neuroblastoma from developing resistance to any one group of medications. One of the meds Toby will get (cisplatin) is especially nasty, in the immediate phase it can cause pretty significant nausea & vomiting & later it has the potential for causing hearing loss. Following the 3rd cycle, Toby will have a repeat bone marrow evaluation (the results of Friday's marrows are still pending) & the surgery to remove whatever tumor(s) is/are left. Please donate blood & platelets if you can. i still haven't posted that update, but wanted you all to know that tomorrow morning toby is going in for bone marrow aspiration and biopsy, to see if his marrows have responded to the 2 mega cycles of chemo so far. on tuesday we will start cycle 3 of chemo. 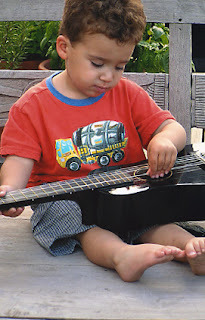 when toby had his first marrows done on april 21, i remember the doctor coming out of the operating room with gallon ziplock bags filled with vials and vials of toby's soft spongy tissue. he told me that he could see tumor in the marrows with his bare eyes. i can't even think about tomorrow. i am so scared. and i pray that toby's marrows are cleaner. our wonderful little boy who can tell you about every train in the subway system, who is beginning to add numbers, who loves tomato soup, who delights in birdsong, our little toby deserves to have clean marrows. just a quick note to let you all know that toby's counts came up during the night and we are now home on kane street. i'll post an update later tonight. for now we are going to enjoy this beautiful afternoon back in brooklyn. Toby was admitted today because of a known, but particularly nasty side effect of his chemo. In addition to wiping out his bone marrow, the chemo's not all that smart. By this I mean that in addition to targeting neuroblastoma cells, the chemo affects normal cells, especially cells that have a quick turnover rate. The cells that line the intestinal tract, all the way from the mouth to the bottom are especially susceptible to chemo. The result is that Toby's mouth, esophagus, stomach, & bottom are raw, tender, & ridden with sores. This obviously makes things like talking & swallowing very painful let alone eating & drinking (imagine trying to chew something salty or crispy with open sores). Toby's weight is down & he's dehydrated, so his docs decided it was time he start TPN (nutrition that he'll receive through his iv). The hope is that as Toby's marrow recovers & his sores resolve, he'll be able to resume eating on his own. He arrived to the clinic today and was immediately given i.v. fluids, as well as blood and platelet transfusions. This weekend Toby was couch-bound; the energetic, playful, and active Toby of last week succumbed to the reality of chemotherapy. Toby's inbetween the second and third cycles of chemotherapy and his bone marrow is pretty wiped out. This means that he has very few white blood cells to fight off infections, hemoglobin to carry oxygen to the body (and a prime source of energy), and platelets which clot the blood and prevent bleeding. 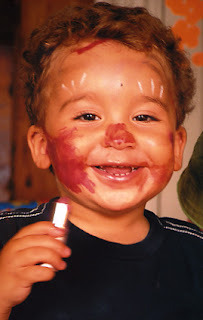 Toby's skin is covered in crops of purple and black bruises (as a result of too few platelets) and rather than exert himself like a normal four year-old, he preferred to remain motionless on the couch (not enough hemoglobin). Toby needs for as many of you as possible to donate blood and platelets, not only before his surgery (scheduled sometime after the third round of chemo), but now too. If you're able to please try to get over to Sloan and donate. Your poignant account (5/17) of a 6 week struggle to find out what was wrong with Toby mirrors my 4 month trial to get a diagnosis- ovarian cancer. You are so generous in sharing your raw emotions, and humanity. You invite us into the heart of your family- I love the scene of Toby running back and forth, while Yoni is belting out, "If I were a rich man." You express yourself so well- it's no wonder Toby is so articulate! The reason I'm writing this on the public blog is so everyone reading it will learn from you how we need to advocate for our own health. Dr, Jerome Groopman, author of "How Doctors Think" (March '07), has been interviewed on national TV. He feels that doctors often think inside the box, and make up their minds about the diagnosis in the first few minutes of the visit, especially now with time-limited appointments. He says, "Doctors frame patients all the time using shorthand, and fail to question their (own) assumptions." So, "Doctors desperately need patients and their families to help them think...How a doctor thinks can first be discerned by how he speaks and how he listens; how he asks questions and how he responds....Emotion can blur a doctor's ability to listen and think." And if we don't get the answers we need by polite conversation, we may need to "scream', as you did, or at least, become firmly and persistently aggressive, as I did. Shalom! Donated blood will be held in Toby's name for up to 30 days, then given to other patients before it expires. Any donation that does not match Toby's will be exchanged with one from the general pool and the name of the donor will be listed in his blood bank. Platelets are especially important for chemotherapy patients. Donated platelets are held for 5 days - first 3 days for testing, then 2 days in storage. Toby's doctors have said that he is likely to need 2-3 units of blood and 2 units of platelets every week for the next six months. The Blood Donor Room keeps track of what the supply and the needs are so that donors are scheduled to best meet Toby's needs. All blood types are acceptable for all donations. Donating blood takes about an hour, including filling out paperwork. Donating platelets takes about 2.5 hours, including paperwork. Products containing aspirin, ibuprofen or similar items cannot be taken before platelet donation. The process of donating platelets is similar to blood, except that you are hooked up to a needle for a longer time (60-90 minutes). Your blood goes into a machine which spins out the platelets and recirculates the blood back into your body. If you plan to donate, please pre-screen yourself by reviewing the eligibility requirements on the website, www.mskcc.org/blooddonations; click on "general guidelines" to begin the review, then scroll to the bottom of the web page & click on "additional donor requirements" & review any section that is pertinent. All donations must be made in the Blood Donor Room of Memorial Sloan-Kettering Cancer Center. To schedule an appointment or get more information, call Mary Thomas, coordinator of the Blood Donor Program at 212-639-3335 or email at thomasfm@mskcc.org. You can also call the Blood Donor Room at 212-639-7648. 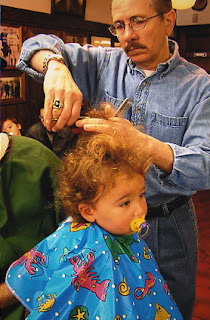 When you make your appointment, let them know that you are donating for Toby Pannone. The Donor Room is located at 1250 First Ave (between 67/68 streets) in the Schwartz Building Lobby. The hours are Fri, Sat, Sun, Mon 8:30-3; Tues, Wed, Th 8:30-7. There is free parking available for donors at the garage at 433 E. 66th St, at the corner of York Ave. You can get a voucher from the Blood Donor room. If you want to donate, and are having trouble navigating the MSKCC system yourself, please email Jessica at jbauman@pipeline.com. I will be happy to do what I can to make it possible for you to donate. As Mooki and Stephen know about specific needs for either blood or platelets, we will get that information up on the blog. Mary Thomas will also know what Toby's particular needs are. Thank you in advance for this extremely important support to Toby and his family. today (5/17) marks exactly 1 month from the day we found ourselves at nyu medical center, scheduled for an xray of the spine, after i screamed at my pediatrician for not taking me seriously. 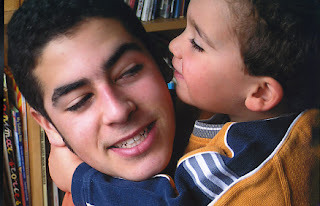 we had been to the pediatrician 3 times over the course of 6 weeks, each time with the same complaint: recurrent neck pain that we felt couldn't be explained away as stress-related. and finally after begging for a ct or an mri or a referral to a specialist, we were given the prescription for an xray. 2 hours after the test, as we were on our way to a neurologist uptown, we got the call from our pediatrician that we needed to return to nyu for a scan of the abdomen. the radiologist had seen something on the xray: the spine seemed fine, but toby was "splinting away" from an area in his abdomen. there was something in his stance that needed to be reviewed. at 4 pm we found ourselves back in the xray room and at 5 pm started the longest ultrasound of our lives. we still had no idea what was going on, but after 90 minutes of scanning, i started to feel prickles of fear. and when the tech told us that the head of pediatric radiology was coming in to interpret the films, i couldn't imagine what the problem might be. at 7:30 pm, she told me they had found a mass in toby's abdomen and put me on the phone with my pediatrician. i don't remember a word he said except for "tumor." toby and stephen were standing behind me, and i started shaking uncontrollably, my hands flapping up and down in a crazy pattern of helplessness and disbelief. i handed the phone to stephen because there was no way in the world i could repeat the words i had just heard. they were gobbledygook, insane torrents of faceless, nameless data. and i ran to the other room and called my brother, screaming into the phone and begging him to translate my agony into something i could understand. that night we were admitted to nyu and started the life we have today. there are moments of surreal beauty. on tuesday we went to prospect park for an hour and sat on the hill, trying to whistle through blades of grass. a man jogged by wearing just his underwear and toby threw his head back and laughed. we took off our shoes and played hide-and-seek behind the tree. and that night the four of us went out for ice cream on court street and listened to our little flaneur's commentary on brooklyn streetlife. last night toby inexplicably spent 20 minutes running (yes, running!) back and forth from bedroom to living room in an incredible display of pluck and sweetness. the smile on his face spread from ear to ear and his gait was familiar, healthy, the old gait. his little body seemed magically solid. for a moment i forgot about cancer. that night he slept in his own bed for the first time in days. while toby was running, yoni was practicing "if i were a rich man" from fiddler on the roof. his classmates had chosen songs from grease, blood brothers, chicago. my amazing, almost-15-year-old boy picked my favorite, quintessentially jewish showtune as his performance piece. he was belting it out, all the yidle-diddles and the biddy bums, accented with full-body shimmying and tevye intonations. and then i heard these words coming from his room: "Lord who made the lion and the lamb; you decreed I should be what I am; would it spoil some vast eternal plan; if I were a wealthy man?" and i realized that stephen and yoni and toby and i are rich indeed. we have been the recipients of an enormous outpouring of love, support and care from an incredible community that blossomed around us in a matter of days. we are being fed, we are being visited, we are being attended to with grace and feeling and goodness. i want you all to know that we are making it through this devastating time thanks to you. a month too difficult to bear, yet studded with moments of true compassion. from mooki: this comes from my friend judy, on her blog grandenchilada. My friend Toby is three years old and he has a very aggressive form of cancer, recently diagnosed. I baked a chocolate cake for his parents and his brother and brought it to his house. I didn't expect to find him and his parents at home. They were told by doctors that they cannot stay there because the environment can be toxic for Toby, who is extremely weakened by chemotherapy. But to my surprise, they were there and Toby was awake and feeling better. He was arguing, refusing (with good reason) to take his horrible, disgusting pink medicine (who do the medicine people think they are fooling with the pink color?) and demanding cookies and orange juice. Toby is a beautiful, gorgeous little boy. His skin is the color of caramel. His lovely soft brown curls are starting to fall, and he has lost 8 pounds, but he still is very, very handsome. He is also strikingly articulate for a boy his age. He talks beautifully. He is very smart. His mother told him I had baked a chocolate cake, a feat that left him unimpressed. He told me he likes vanilla better. He has very definite opinions, and not only about cake. I gather he has strong opinions about subway lines as well. I'd love to talk to him about this topic in more detail when he gets better. 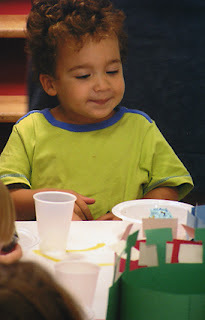 Toby got a video made by his teacher at school, with all his classmates greeting him through the camera and listening to wonderful, silly songs that the teacher made up. I don't know if I can describe Toby's face as he watched his friends. A smile appeared that belonged to someone much older, someone like a very wise adult. A skeptical smile. A knowing smile. What was he thinking, this brave little boy, whose life has become an inexplicable nightmare? There are my friends, their normal selves in their normal, relatively carefree lives, and here I am. My world turned upside down. My life completely changed, my days and nights plagued with sufferings of all shapes and sizes. For no rhyme or reason. How unfair it must seem. How incomprehensible. Toby's parents are heroic. I have only seen them twice, but they seem to have a steady, defiant calm I don't think most people could muster under the circumstances. I hope with all my might that they will soon see better days, and they will play with Toby in the sunlight. Stephen's sister, Anna, found the link in the Courier. today was supposed to be a low-impact day: no chemo, no long day scheduled at the hospital, no round-the-clock iv fluids or antibiotics attached to toby's central venous catheter by way of an awkward backpack filled with beeping pumps and bags of liquid. today was supposed to be a quick visit to the hospital and an afternoon spent enjoying our new digs on kane street. i awoke early this morning in a state of anxiety about greg's departure. in addition to everything else he did this week (secure 2 sublets, drive us to the hospital or back each day, move our belongings, buy a new vacuum and deep clean the apartment, do laundry, take yoni to all his practices, buzz toby's hair, go to the yard sale, sit with us for hours during interminable hospital waits, and engage in hand-to-hand-combat with a renegade mouse) he managed to create an incredible bond with toby. we will miss him terribly. so we arrived at mskcc at 10 am and waited in the iv room to get blood drawn from toby's "tubies." 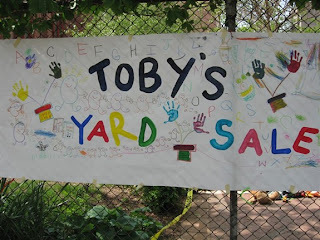 we had already told toby that this was the only thing on the agenda (reminder to self, NEVER make that mistake again). we were in a silly mood and toby happily submitted to tickling. it was only after the blood work that we remembered that today was monday, one of the dreaded bandage change days. the nurses have recently migrated toby over to primapore bandages instead of the tegaderm bandages he has been wearing since mid-april, because his chest skin is severely irritated and in danger of breaking down due to frequent adhesive removals. (imagine a 5-inch square super-sticky "skin" applied and removed 3 times a week, right in the middle of your chest. the bandage needs to be peeled away with solvent to prevent skin tears and then, once the area is already nice and irritated, it requires cleaning with a burning cleanser for 30 seconds while applying pressure. suffice it to say that bandage changes are one of the worst aspects of being sick for toby.) the primapores are smaller and easier to remove, but leave a strong coating of very tacky residue that needs to be cleaned before the next bandage can be applied. as of today we're onto our third type of bandage, the tielle, which i hear costs $10 a piece. none of this was pleasant, but we made it through. while we waited for toby's counts to come back from the lab, we played in the playroom with a remote control car. he was in a great mood, asking for food, relaxed, smiling. and then came the news that toby's white blood counts had dropped to .5 and his absolute neutrophil count was at zero. now officially neutropenic, toby needed to get an insuflon (an indwelling tube that is inserted under the skin of the thigh) and receive his first dose of gcsf, the shot that stimulates white blood cell production. stephen was at the pharmacy trying to get toby's oral medications flavored with cherry and watermelon since he has refused to take any medicine for the last week. and so i was left alone with toby and the knowledge that in just a few minutes he would have to undergo yet another painful, frightening and hated encounter. and i think i quietly panicked. toby was hungry so we ate cheese and pickles and tomato soup and fries (amazing, really) and i explained that we needed to get the insuflon. recently we've been more straightforward with toby. he's not just "sick" anymore. we have told him that he has something called cancer, that he needs to get a medicine called chemo to get better. that the chemo medicine sometimes makes hair fall out, but that it will grow back. that he will sometimes have to be at the hospital to get better. i don't know if we're doing the right thing; there's no roadmap that i've found for how to explain this to your child. and today, i quietly explained that he was going to get the insuflon because he needed it to get well. he immediately tensed and asked why he had to get it again, for the second time (dear god, how can i ever explain that he'll need it many more times). but i think he would have been fine, had we not had to wait for another 30 minutes, during which time he got more and more anxious and overwhelmed. by the time stephen came back and we were called to the iv room, toby was completely hysterical, screaming "i don't want it" over and over again. he was so distressed that he threw up immediately after the insuflon was inserted. all those calories wasted. but it was only 2:00 and the sun was shining and we were on our way back to brooklyn with a limp boy in the taxi. once we got back to kane street, toby regained some energy and went on an errand in his stroller with stephen. but then evening came and we needed to administer medicine and swab his mouth in preparation for the sores that fill his throat and tongue, and give the gcsf shot. every time we begged him to take medicine, or restrained him while administering the G-shot, or made him scream while changing his bandage or held his arms while swabbing his mouth, i felt like i was violating my child and betraying his trust. mommy and daddy are supposed to comfort and protect. how must he feel never knowing exactly what's going to happen? are mommy and daddy going to hurt me again or can i finally hear a story and play with my cars? i cried repeatedly today. and my heart broke a hundred times. as i lay in bed next to my exhausted child he whispered to me, "the G-shot will make my cancer go away and i don't like my medicine because it's watermelon not cherry and i want mouth sores because i like to eat cold popsicles in the morning and did you know that there's a B100 bus?" he kissed my hands and nuzzled me and thankfully, fell to sleep. i want to write about the amazing yard sale and the continuous outpouring of love and support that you have given us, but i'm just beat. hopefully tomorrow will be a quieter day and i will be able to let you know how grateful we are and how much your care means to us. They will be at this address until 6/16. In response to yesterday's stoop sale, I want to tell you how awesome, amazing, & extraordinary each & everyone of you is. You are truly exceptional people. We are so fortunate to have such excellent friends. Mooki sent a link to view pictures, unfortunately, it's password-protected, can anyone help. Also, is there anyway to access the Park Slope Courier piece on-line (I've been unsuccessful and so has Rox)? Perhaps a link could be placed on the blog. To all the mothers, have a well-deserved day. Toby, Mooki, and Stephen spent another day in Manhattan. Their visit to SK was short today and they were back at RM by early afternoon. I had dinner with the three of them tonight at RM (the food was compliments of one of the many cooks that deliver daily to Stephen and Mooki's apartment). Toby was amazingly energetic - wanting to show me the key sights - the elevators, the terrace, their room, the kitchen, the 11th floor, and the playroom. He was so happy and funny. He looks great and he's style'n with uncle Greg's haircut. Stephen and Mooki are, of course, both amazing and strong. Even under this tremendously stressful situation; their little boy being treated for a horrible disease, their lives turned upside down, little ability to plan anything beyond a couple of hours, virtually no time for themselves, constantly changing living conditions, hours of waiting, an overload of inform ation concerning treatments, medications, schedules ... they remain calm, loving, and caring. Toby finishes his second round of chemo tomorrow (mon). He'll be disconnected from the IV early afternoon, then we'll head back to their temporary apartment (until June 17) on Kane Street in Carroll Gardens (Carroll Gardens is another neighborhood in Brooklyn - a mile or two from the Park Slope neighborhood). Yoni and I will move some items over there tomorrow morning so that they can start to settle in a little. Vivien and Mike Shelanski are the generous couple who are providing the apartment. 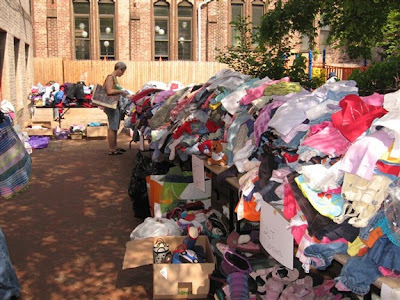 The generosity of the people here in the Park Slope neighborhood, as well as the parents and staff at the Bean Sprouts School, continued today with a yard sale at the Methodist Church courtyard on 6th Avenue. Stephanie Caloir, one of the parents of a Bean Sprouts child got the idea rolling and the staff at Bean Sprouts helped make it happen. They had fliers up and down 5th Avenue as well as information written in chalk on the sidewalks. 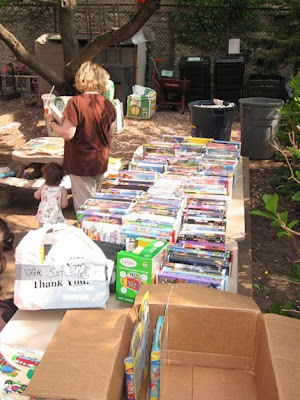 I arrived at about 2 pm to find the courtyard filled with clothing, toys, books, videos, strollers, etc. all donated by people in the community. About 40 people where shopping at the time - they raised about $3000. Even one of Toby's friends, Sam, had a lemonade stand to help raise money. What wasn't sold was donated to a charity that supports children at a school in Africa. Fortunately, the day was warm and sunny. Toby made the front page of Friday's Park Slope Courier; the headline reads "3-Year-Old vs. Cancer" in inch high bold lettering. Photos from the blog were also on the front page. A very nice article accompanied the headline and photos. The paper was delivered this morning and as I walked the 8 blocks from their apartment to the yard sale, I saw Toby's face on many stoops. Yoni helped his soccer team win another game this today (3 to 1); then he spent the afternoon and evening with his friend Gabriel. They apparently made $20 each doing some yardwork. Toby's second round of chemo started yesterday. They went to SK at 8:00 am but didn't start until 10:30 am. They left at 6:30 pm to spend the night back at RM. IVs remained attached and Toby has a little backpack to hold the medications so that they continue to flow all night. Even after being hooked up all day and restricted to the hospital bed, Toby was still finding ways to have fun - listening to Randy's CD (a local musician who plays for the kids a Bean Sprouts), reading, playing on mom's Blackberry, swinging Tigger from the curtain lines, and eating his new favorite foods - Doritos, Starbusts, and Chuckles. He seemed almost oblivious to what was going on. Mooki says that will change today as the chemo kicks in. They'll be back at SK today and tomorrow. The process will be completed on Sunday morning. Stephen and Mooki tell me the RM house is comfortable - like a very nice hostel. Toby likes it of course as it has elevators! Apparently they visited all 11 floors on Wednesday evening. The generosity of the local community continues to amaze me. Steve and Mooki were offered a small furnished apartment in Carroll Gardens until they move into their summer sub-let. After having a burger and beer at the Union Street Cafe, Yoni and I went there last evening to meet the owners and see the apartment. The owners are a middle aged couple - late 50's/early 60's. They keep the apartment on the top floor of their brown stone for visitors. He's a professor at Columbia in the medical area - nervous system disorders. I don't recall what she does. They did not want any rent from Steve and Mooki and only asked for a donation to the Kane St. Synagogue. Steven and Mooki are discussing the pros/cons of moving in. If they decide to move, they'll do so on Sunday. Yoni continues to do fine - he's a very independent young man. We had some time last night at dinner to discuss some of his favorite topics - rockets, planets, and stars. Today's fundraiser is a yard sale. It's scheduled for 10am to 4pm at the Park Slope United Methodist Church at 410 6th Avenue in Brooklyn (Between 8th and 9th Street). many of you who know me know that i have issues with hair. in the third grade i had to write a personal essay: what was my favorite color, who was i named after, what did i like to eat. i don't remember my answers to any of the questions, except to this one: What is your favorite thing about the way you look? my answer, of course, was: MY HAIR. so for a very long time, a very large part of my identity has been consumed, by my hair. and since monday, i have watched as my dear sweet child's hair has fallen out in chunks on his pillow, on our couch, on the fronts of everyone's shirts, on the floors, and in the bathtub. yesterday we attempted to shower toby, after wrapping his torso in saran wrap and covering all his incisions and openings with plastic. this "shower" took place on a chair in the bathtub, with a trickle of water flowing and 4 hands required to adjust and soap and rinse and readjust. this shower was not relaxing or regenerative in any way. and this shower left me with handfuls of toby's hair slipping through my fingers and collecting around his feet near the drain. i know hair is one of the least important issues right now. i also know that my vision of my child changed this week from healthy, happy toddler to fragile and sick. i look at him and realize, not for the first time, what a long road we have in front of us, what an incredible human being he is, how funny and smart and sweet, how engaging he is with others, how loving to all of us, even in the midst of the horrors he must suffer. i look at toby and decide that uncle greg will buzz what remains of toby's hair, so that it won't itch, it won't prickle and it won't keep making me cry. we just returned from mskcc, where we found that toby's white blood cells are at 11 and his platelets at 79. in light of this the docs have decided to start our second round of chemo tomorrow, choosing not to wait until day 21. this aggressive approach is what mskcc is known for, and while i embrace it (and the onslaught of poisons onto the tumor), i also recognize that toby has felt good for 3 days now and it breaks my heart to know that tomorrow he will start to feel bad again. yesterday we actually spent 2 hours at the brooklyn botanical garden with uncle greg. bbg is one of toby's favorite places in the world and we thrilled to see him pushing his stroller through the herb garden paths, pretending to be the A or M or 4 train. we made the obligatory visit to the children's garden where toby ate a contraband hotdog while peering through the leaves for a glance at the franklin avenue shuttle S train. it was such a beautiful day. toby's appetite returned for these few short days and he polished off quite a few bags of pringles and starburst, in addition to some real food. the docs and nurses tell us that a child's tastebuds completely change following chemotherapy, so we've been surprised at some of the foods toby has responded to. spicy seems good and we're constantly trying to offer different choices. our main goal was to bulk up the little guy yesterday and today, since he has already lost 8 lbs. we succeeded with a 1.2 lb weight gain, so he's up to 37.2, but with the specter of chemo tomorrow, he may lose more. as you all know the apartment situation has been incredibly stressful. yesterday we decided to sublet a furnished apartment in carroll gardens from june 17-sept 1. this will give us some time to find a permanent place. we will most likely sublet our current apartment to a few grad students and leave all our furniture here. the docs have made it clear that we should spend as little time in our apt as possible, because of toby's compromised immune system. tonight we head up to the ronald mcdonald house on east 73rd street, for hopefully 3 or 4 nights. yoni will most likely stay at the apt with greg. after saturday, greg is returning to michigan and i don't know what we will do. if anyone has a temporary sublet available for 2-3 weeks, please contact me as soon as possible. you, our wonderful community of friends and family, have been invaluable and precious to us. your devotion and love are so very appreciated. we need you and are immeasurably grateful to you. please continue to send us your thoughts and prayers. they matter more than you know. As expected, Toby's hair is falling out, but Toby remains in good spirits. He had Mac & Cheese for lunch and the doctors have predicted a good appetite until at least he starts his next round of chemo Thursday or Friday. And once again, thank you for all your absolute devotion to providing care, comfort and support to Toby and his family. The idea for this project came when Toby's great aunt Blanche decided to wear a T-shirt in honor of Toby in the Survivors' Lap of the American Cancer Society's Relay For Life in June. Then she thought that others might want to do the same. So a local artist, Jon-Paul Bail is manually printing each shirt, using a silk screen process, with 5 color separations. Thanks to his discount, you can order a 100% white cotton tee for $15.00 and $10.00 will go towards Toby's care. A local businesswoman, Kanan Gupta, is offering her packaging and shipping services at a discount, also. You can download a PDF of the order form here. hello everyone, we are back in the hospital since friday evening, because of a fever and slowly readjusting to life on the inside. friday at home was actually lovely... stephen built a lego train track that enticed toby to play on the rug for the first time in many days. saba was able to elicit some belly laughs and randy came over for some quick songs. but then it was back to mskcc and admission through the urgent care center where toby was immediately hooked up to iv antibiotics to treat a possible infection. while we were waiting for a bed to open up on the 9th floor we found a roll of medical tape and toby taped up his hospital bed from side to side. one of the nurses also brought in a small craft kit with four tiny paint pots and a white plastic fish. we covered toby's lap with a sheet and he jackson-pollacked the fish with interest and intent. stephen also discovered that his itunes stash on the computer is a great distraction for toby. since that night mommy and daddy have danced around toby's bed to booker t while toby grooves lying down. it's a new activity, one born of our new reality. so far it works amazingly well. toby spends most of his days in bed, with short forays to the playroom and around the ward. we want him to be up and about as much as possible, but he tires quickly. so we're trying to come up with ways to make the hospital interesting beyond the constant beckoning call of tv. over the weekend toby did his "homework" on the computer, typing pages of letters, increasing the font size and cycling through the pages like a stop-motion animation. so we're in until toby's absolute neutrophil count rises to 500, which may take a few days. i hope that we'll have a tiny window to return home before his next cycle of chemo starts. we are currently at day 14, with the next treatment scheduled to start on or about day 21. however, the protocol is aggressive, so if the docs deem he is ready to start before day 21, we will. toby has now lost 8 lbs, down to 36 lbs. for the last few days his mouth and throat were filled with sores (a side effect of chemo) so he was unable to eat much of anything. the nutrition staff suggests liquid foods during this time, but toby tanked out on icecream and jello pretty quickly. yesterday out of the blue he announced that he wanted chips and stephen ran out to get cheetos, pringles, anything with taste and salt. i couldn't believe that his poor swollen mouth could handle those intense flavors but he relished the jolt of flavor. last night he actually ate 4 small bites of pizza, so we might have a few days of real eating before the 2nd cycle. toby still looks beautiful, with his new short cut and lingering suntan from jamaica. he is the most delicious little boy. the long road ahead seems cruel and unfair. we try to take it day by day. my tears are short, fierce and usually come in the early morning, at the moments between sleep and wakefulness, when i remember our old life and am confronted with the new. uncle greg pannone drove all the way from michigan, arriving late on saturday night after a detour to queens. we are so grateful to have him here for the week. yoni is doing okay, very busy with sports on the weekends and school the rest of the time. yesterday we had a normal dinner together and right now he's sitting next to me having breakfast. a totally inadequate thank you to all of you for your continued and amazing support and love. the food, visits, words, errands, energy, gifts and prayers are so, so important to us. we have just started on this journey together. Toby made it home earlier this week. Initially, the transition back to home was a difficult one. Toby was particularly fussy, but today he had a better day. He showed shades of himself, playing on the carpet & engaging those around him. This evening Toby was readmitted to Sloan because of a fever. As expected, his blood "counts" have bottomed out. Toby's white blood cells & his ANC are zero, & for this reason, he's unable to mount a significant response to infection (i.e., fever) & needs i.v. antibiotics. 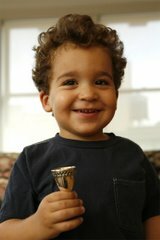 Tomorrow, Toby's saba & savta (grandparents) return to Israel. They provided moral support, cooked, cleaned, & shopped. They will surely be missed. Greg, Toby's uncle, arrives tomorrow for the week. On the homefront, Mooki & Stephen are still searching for a new apartment. If any of you have any news or suggestions, please let Mooki & Stephen know. Finally, Fran, Heather, & Carie met today to make sure that everyone's efforts to help out are maximized & coordinated. coaster ride that i'm still catching my breath. on sunday we were told that if toby made it through one more night without a fever we could be discharged, with daily outpatient visits until the next fever or problem arose. dr. kushner had warned us that we might spend 3 weeks inpatient because of the size of toby's tumor, so we were cautiously optimistic about going home after a week. sunday night was fever-free, but on monday morning at 11:00 (we had been up since 5:00) we were told that there was a disagreement about whether we were going home after all. finally at 1:00 pm the docs agreed and we started the long process of discharge. but first a blood transfusion which took more than 3 hours. and then training on how to administer the daily GCSF shot and then waiting for the pharmacy to fill 5 different prescriptions in huge brown bottles, and then collecting 3 bags of syringes. and then at 6:00 we finally left the hospital, in a chai lifeline van driven by shloimie. and then at 7:00 we arrived home, with toby exhausted and limp, barely aware that we were back in brooklyn. that night i slept on the floor next to his bed. the chai lifeline people have been nothing short of amazing. each day two little orthodox women stop by toby's room, bringing bagels, danish, treats. later another duo visits to see how we're doing. every weekday we call hersh to arrange transport for the next day. our rides so far have been a lesson in cultural anthropology. jolly shloimie, long beard and sidecurls bouncing as he talks. next morning mrs goldberg, driving her own suv with 4 baby carseats and hebrew devotional a capella music blasting. and yesterday, yoeli mid20s (call me joe) in a lexus suv, white leather seats, gps, a trunk full of highend gym equipment, barking in yiddish on his razr cellphone. these highly observant jews are real practitioners of "hesed shel emet," (in hebrew, the charity of truth) they find the place of greatest need and give without any afterthought or calculation. tuesday morning found us back at the day hospital for the entire day. toby was dehydrated so received iv fluids and had blood drawn. his counts were down to zero which explained his lethargy and total lack of energy. everything was a struggle and the day was one long painful crying jag. we were sent home with iv fluids in a 44-hour wearable backpack which i'll wear until we go back to the day hospital tomorrow. a bright note was meeting gretchen and larry witt, parents of liam, a beautiful little boy who has the same diagnosis as toby. today was our first full day at home while toby is on treatment. it was a mixed blessing... while i relish being away from the hospital, the reality of home, with unyielding sofa, uncontrollable air and untenable shower is difficult. toby was exhausted today and spent the entire day in bed, unable to even listen to a story. he takes out his frustrations and pain primarily on me, screaming "i don't want you mommy" all day long. stephen calms him and by the evening toby accepts my lap. toby is still not eating. we had 2 "meals" during our weeklong hospital stay, but now the most he can ingest is 2 spoons of soup or ice cream and a few goldfish. he looks so fragile to me. stephen administers his first shot of gcsf into toby's thigh while i restrain toby. these shots are given for 10 days to boost the white blood cell count in preparation for the next round of chemo which will decimate them again. the solution burns as it enters toby's body and his screams echo for hours. an incredible woman named gina, from kidz cut zone, comes to cut toby's hair this evening. he has been scratching his scalp for days and the docs say that his hair follicles are already affected by the chemo. it will be more comfortable for toby with a summer cut. as usual, he is fantastic and receives a great cut. i'll try to post photos. toby's hair will probably fall out in the next 2 weeks. gina refuses payment. and now for the kicker: we need to find a new apartment. we had the house environmentally tested last week in preparation for toby's return home between rounds of chemo. the results are bad: highly elevated levels of lead and toxic metals in the house, in addition to dust mite infestation and aspergillus mold throughout. so we need to find a new place quickly. if anyone knows of a 3-bedroom apartment in park slope or windsor terrace, available this month, please let us know as soon as possible. i will let yoni know tomorrow, since he is still in mourning for the cats. thank you to adina and mark for housing our cats. thank you to jessica bauman and jamie principe for being on-call the last 2 days and doing so many errands. thank you to sue weinstein from beansprouts. thank you to stephanie for putting me in touch with candlelighters. thank you to aileen, one of toby's teachers for an absolutely amazing visit in the hospital. thank you to mirm for delivering food. thank you to susan fox for her psp toby updates and great ideas. thank you to heather for her constant attention, love and coordination and for bringing aileen to the hospital. thank you to itamar and sonia for another wonderful hospital visit... taking toby on an elevator scavenger hunt after convincing the docs to give him an hour pass to leave the ward. thank you to all of you who sent emails, wrote letters, called, visited, worked on the blog, gave gifts, brought food and thought of us. you are incredible. We have registered with chai lifeline, a group that can offer us free transportation mon-thursday. We will need transport on fri, sat, sundays. Is there any way we could add this component to the calendar? Maybe there could be an AM and/or PM driver slot? On those days that no one signs up we'll rely on car service. We would also need to let people know that flexibility is impt, as it may turn out that we don't (or do) need a ride with just 24 hrs notice. I recognize that this may be difficult to coordinate, so if it seems like too much of a bear, we totally understand. If you have already signed up, thank you! Please stay in touch with Heather for details on delivery, etc.